Cheese dip and sour cream are microwaved until warm and served with an assortment of dippers for family-pleasing fun. Mix CHEEZ WHIZ and sour cream in 1-quart microwavable bowl until well blended. Microwave on HIGH 2 to 3 minutes or until heated through, stirring every 30 seconds. 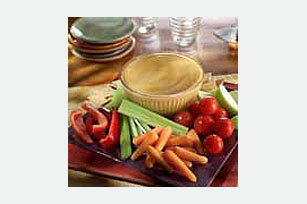 Serve warm with assorted cut-up vegetables, pretzels or soft breadsticks. This warm, cheesy dip is good for a special occasion, such as a family party, because it makes many servings.